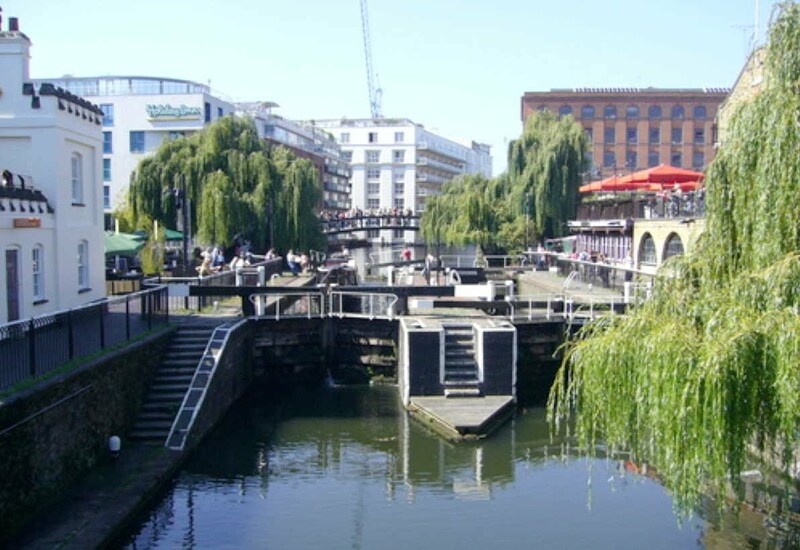 Two structures span the Regent’s Canal at Hampstead Road Lock: the double lock itself, and the roving bridge. The elegant cast iron profile of the roving bridge (Grade II), which dates from 1845, makes it one of the best known structures in Camden. From the bridge there is a fine panorama clockwise from upstream of the former railway offices (now Henson House), the Interchange Warehouse and towpath bridge (both Grade II), Camden Lock Market and Dingwall's Dock, Hampstead Road Lock (Grade II), Camden Road Bridge (Grade II), the Lock Keeper’s Cottage (Grade II), Gilbey House and the Regent’s Canal upstream to Southampton Bridge. Gilbey House is the large white building on the south side of the canal by Southampton Bridge, the former Bottle Warehouse built by William Hucks. Next to the building frontage onto Jamestown Road, at Nos.34-36, is a very large ice well built in 1839 at the head of William Leftwich’s basin (now filled in), and deepened in c1846 to 100 feet (30 m) to hold about 2400 tons of ice. There is an information panel at the site. The lock keeper’s cottage on the south bank is now the Regent’s Canal Information Centre and dates from c1816. It was extended and altered c1975. 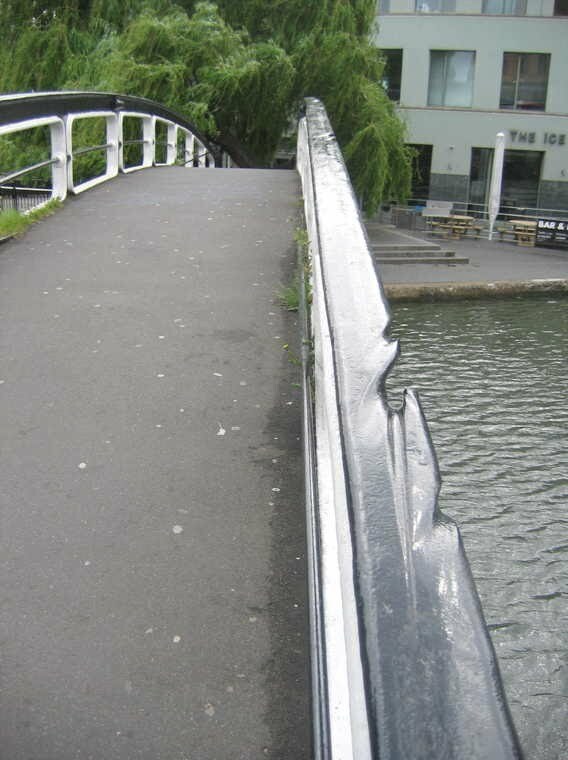 The stone parapets and cast iron handrails of the roving bridge are scarred by the tow ropes of barges drawn by horses out of the lock and under the bridge which takes the towpath back onto the northern side of the canal. The scarring occurred because sand/silt from the canal picked up by cotton ropes, which sink in water, abraded the iron and stonework of canal structures.